Highest position in Explore = #1 on April 27th, 2009, thank you! 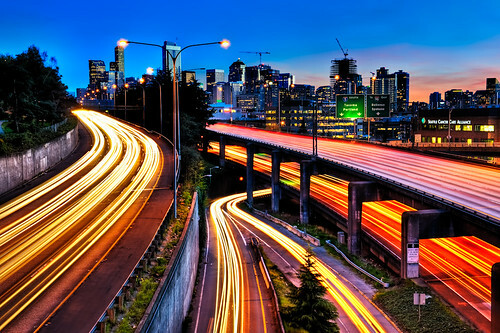 This is a shot of the I-5 freeway heading southbound into Seattle. I just loved how there was traffic flowing from all directions in this shot. The freeway was moving pretty fast on this night and I was able to really capture some solid traffic streams with some nice curves and lines. This is a 9 exposure HDR shot to capture the detail of the city and to bring out all of the traffic lights in motion. I’ve been rather busy as of late with work and some exciting new business opportunities which I hope to write more about later.. So I apologize if it seems like I’ve neglected your streams but I’ll definitely be playing catch up this week and look forward to connecting with you all soon. Have a fantastic week!